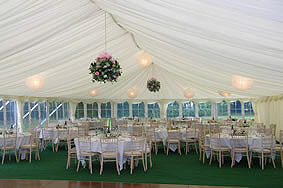 A Family Business Providing Marquee Hire Since 1989. We provide marquee hire for weddings, making the day a day to remember. We provide marquees for parties, private occasions and corporate events across Hampshire and Wiltshire. 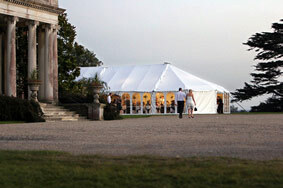 So if you're looking for Marquee hire in Hampshire or Wiltshire give us a call, we'll be happy to assist. For a guide to marquee hire click here or the answer to ‘How do I hire a marquee?’ click the question. We operate exclusively in Wiltshire, Hampshire and West Sussex within a 50 mile radius of our Southampton base. By limiting our area we offer you an exclusive and personal marquee hire service tailored to your exact requirements. Hugh & Mandy welcome you to Southern Marquees, a family company with over 20 years experience in marquee hire, providing beautiful marquees for all occasions. We hire a unique clear span design that retains the shape, romance and charm of traditional marquees but with no centre poles, giving an uninterrupted area inside. For info on what size of marquee you might need click here. Southern Marquees will make your special day the day you've always dreamed of ! We started Southern Marquees over twenty years ago and realised very early on that we wanted to specialise in weddings, parties and corporate events. Our attention to detail and the quality of our marquees is what makes us stand out from the crowd. We offer a modern clear span design unique to Southern Marquees. Unlike other systems, our marquees retain the shape, charm and romance of the traditional marquees with all the advantages of the clear span marquee with no centre poles, giving an uninterrupted area inside.